The overarching goal of this research component is to detect, understand, and predict fluxes and pathways of gas, water, and solutes in the unsaturated zone. Physical properties of near-surface soils and deeper unsaturated zone sediment control hydrologic processes including runoff generation, groundwater recharge, contaminant transport, and preferential flow. 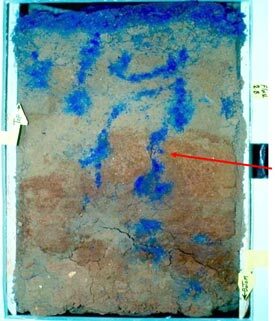 Thus, soil-hydraulic property characterization is a cross-cutting theme of this research. Critical issues related to scaling between lab and field studies are addressed. Changes in soil-hydraulic properties including hydraulic conductivity, sorptivity, soil-water retention, organic matter content, and porosity can substantially affect unsaturated flow and runoff generation at the hillslope scale. 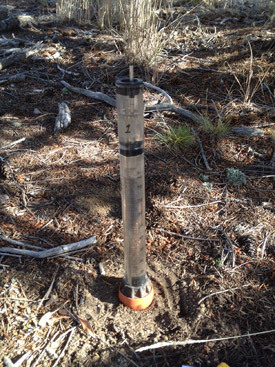 Our field and laboratory investigations quantify changes in hydrologic states, fluxes, and processes that result from soil-hydraulic property shifts driven by climate and land-use effects. The motivation for our research efforts is improving understanding and numerical modeling of impacts on water quality and quantity as well as water-related natural hazards. Recent research areas have included Colorado, Nevada, and Oregon, USA. Our research activities in gas transport focus on quantifying concentrations and fluxes of naturally occurring gases (CO2, CH4, H20 vapor) as well as contaminant gases introduced via the interment of low-level radioactive and chemical waste in deep desert unsaturated zones. We combine field studies conducted at the USGS’s Amargosa Desert Research Site (ADRS: http://nevada.usgs.gov/adrs/) and multiphase flow and transport modeling. Recent work examines results from a field-scale natural gradient tracer test at the ADRS using SF6. The deep, cross-well tracer test represents transport over greater temporal and spatial scales than those addressed by typical laboratory-scale and in situ tracer studies to evaluate field-scale soil transport parameters and mechanisms of preferential migration. Soil physical factors, preferential flow paths (often listed as macropores - illustrated in photo to right), and other physical and chemical parameters such as bio-remediation and biological processes are of significant environmental importance on contamination of groundwater and are thus, the main focal areas for this research. Of particular importance is the influence that preferential flow has on physical, chemical, and biological processes (such as volatilization, sorption, and degradation) that affect herbicides, nitrates, remediation, and other contaminants. An ongoing challenge is how to scale transport factors and processes observed and/or modeled at the laboratory to field to basin scales. The consequences of soil properties and related parameters are significant not only to flow and transport of contaminants under agricultural conditions, but also under environmental and industrial settings such as those due to mining, wastewater, and soil-water-chemical interactions. For instance, mining practices have exacerbated soil-surface runoff and erosion with resultant transport of heavy metals and other chemical constituents through preferential flowpaths to groundwater and into adjacent streams and reservoirs. An example of such a case is in the Aries River Basin in Romania and potential pollution of the Danube River. The photo to the left is of a reservoir filled with soil and heavy metal contaminants in the Aries River Basin. The scope of these types of problems is global. Stearns, M., J.A. Tindall, G. Cronin, M.J. Friedel, and E. Berquist (2005), Effects of coal-bed methane discharge waters on the vegetation and soil ecosystem in Powder River Basin, Wyoming, Journal of Water, Air, and Soil Pollution, 168, 33-57. Tindall, J.A., R.J. Szmajter, and S.M. Cuffin (2005), Part 1: Vadose-zone column studies of toluene (enhanced bioremediation) in a shallow unconfined aquifer, Journal of Water, Air, and Soil Pollution, 168, 325-357. Tindall, J.A., E.P. Weeks, M.J. Friedel, and A. Nutt (2005), Part 2: A field study of enhanced remediation of toluene in the vadose zone using a nutrient solution, Journal of Water, Air, and Soil Pollution, 168: 359-389.